Comes from Solingen, Germany, and is made of aluminium alloy tubing. The manufacturer has taken out a patent on the clever eccentric-clamp technique, which enables the pole sections to be fixed at exactly the length you want. It enjoys various advantages: one, it’s extremely firm; two, it’s easy and quick to operate; three, it doesn’t get stuck (like most telescopic pole fixing devices do!). The pole can be fitted on to e.g. the apple-picker’s bag with adapter, or similar implements (as long as they’re equipped with the requisite piece of tubing!) by means of either the illustrated universal conical plug (detachable) or the ¼ inch outside thread underneath it. An angled bracket and an adapter for ordinary-sized broom handle thread are obtainable from us separately. With detachable plastic conical plug and ¼ inch brass outside thread. Tube 2.5 cm in diameter. 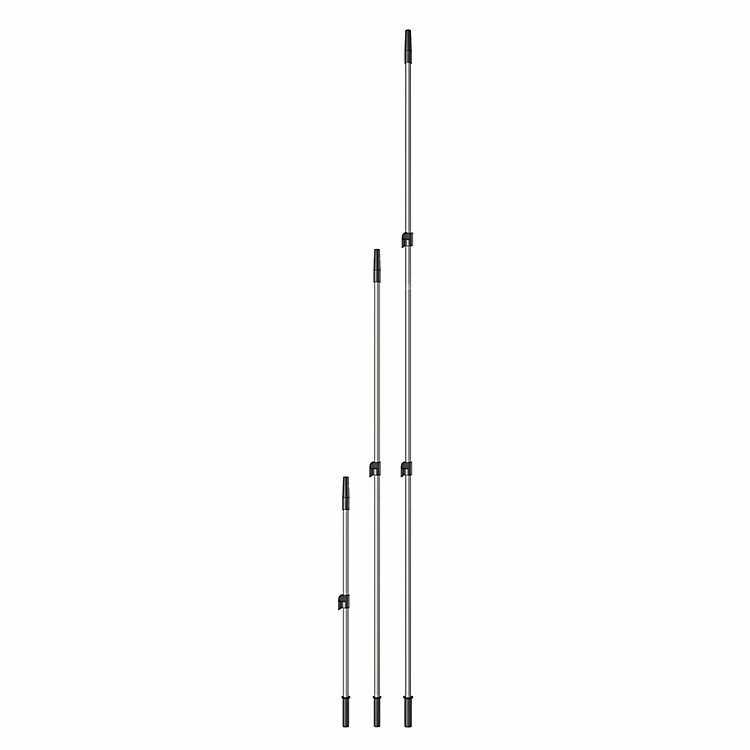 Telescopic pole, in two sections, up to 2 m extended length. Length 117-200 cm. Weight 560 g.
Telescopic pole, in three sections, up to 2.9 m extended length. Length 122-290 cm. Weight 830 g.